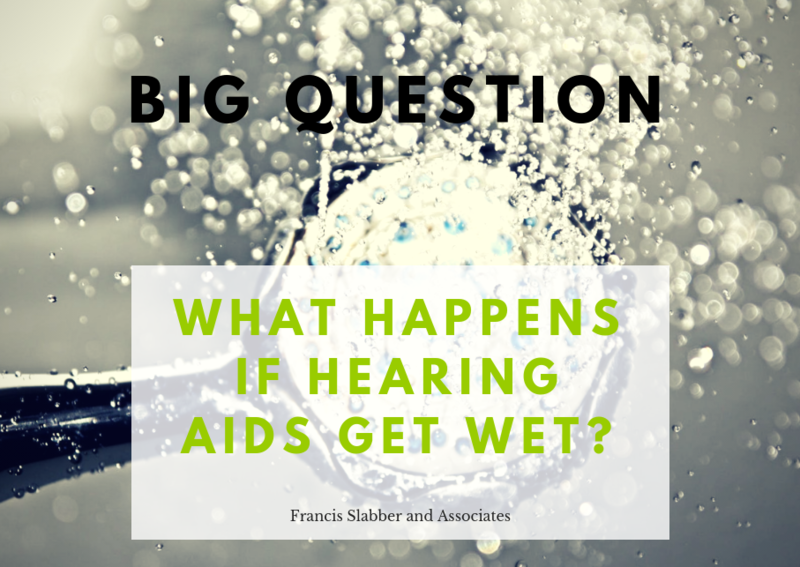 What happens if Hearing Aids get wet? Patients often ask us about how safe their hearing aids are when it comes to water. All hearing aid users have a fear of accidentally hoping into the shower or diving into the swimming pool without removing their hearing aids- and with today’s tiny and comfortable hearing aids, quite a large amount of people have actually done this! There are also lots of opportunities for moisture to get into a hearing aid outside of human error- sweat, wet hair, getting caught in a drizzle, or getting splashed all mean that a hearing aid cannot avoid water altogether. So, the Big Question is- What happens if my hearing aids get wet? Firstly, wearers of new hearing aids can relax a little, because most of the new hearing aids out today have a high protection rating against dust and moisture. It is now uncommon to find a new hearing aid that is not either IP67 or IP68 rated. The second figure (the 7 or 8) refers to the device’s water resistance. The implication with an IP67 rating is that the device can be submerged in up to 1 meters of water for up to half an hour, and the IP68 rating could mean that it can be submerged in between 1.5 meters and 30 meters of water for up to half an hour- but this depth must be specified by the manufacturer. This means that if your aids get splashed with water, they will probably be ok- however, like with your watch, it’s probably best to avoid it if possible. Remember that these determinations are made in perfect conditions in a lab, and there may be other variables that affect their ability to resist water, so don’t try to test this yourself! For day to day moisture, hearing aids that get splashed or sweaty will usually be fine with the correct long term management. Hearing aids must be kept in an active drying system every night. This might be in a closed container with a fresh dry capsule (these usually start out dark orange- if it is light yellow it needs to be replaced), or, for first prize, in an electronic dryer, which uses air and sometimes UV light to gently dry the hearing aids completely over night. These systems ensure that when you put the aids on in the morning they are starting out completely dry. It is also essential to ensure that aids are serviced annually to identify signs of moisture and address them before they start to cause long term damage to the aids. But what happens if you do make that terrible mistake of jumping into the pool with your hearing aids in? Well, of course, remove them as soon as you realize. Remove the battery completely, and gently use a tissue to mop up any visible water. Never, ever, ever apply any heat to the hearing aids while they are wet. Do not use a hairdryer or the stove or microwave to attempt to dry the aids- this is far more damaging than the water itself. It’s best to immediately place them in your dry container at least over night, or, if you can, get them to your audiologist who can put them in an electronic dryer as soon as possible. Rechargeable hearing aids should never be charged when wet. Always make sure that the aids are completely dry before using them again, and if you hear any difference in sound quality, send them in to the manufacturer to be checked as soon as you can. Remember, that the ratings and tips described above are only applicable to pure water. They do not apply to other liquids such as juice, tea, or salty sea water. The elements in these other liquids may be able to permeate the water resistance even if the water would not on it’s own. If your hearing aids end up in your cup of coffee, or get splashed by an ocean wave, please send them in to their manufacturer as soon as possible to ensure that they are cleaned and checked thoroughly, inside and out. Do you have any questions about keeping hearing aids dry? Do you want more information about electronic dryers or the IP rating of your hearing aids? Comment below, or contact us for more information.